What is the deadline for making my HSA contribution? What are the eligibility requirements for contributing to an HSA account? Can another person who is over 65 contribute to the HSA of an individual under 65? Can individuals make their entire contribution to the HSA at the beginning of the year? Can an individual contribute a certain amount of dollars over the deductible amount to cover the set up and administrative fees of the HSA account? Does my HSA need to be set up with my Health Insurance Company? Do I have to have "earned income" from a job (as opposed to income from dividends and interest)in order to deduct my HSA contributions for income tax purposes? Do contributions to an HSA in any way affect my ability to contribute to an individual retirement account (IRA)? Do you recommend funding my HSA with a rollover from my IRA? How does a spouse's health coverage impact contribution limits? How does a domestic partner's health coverage impact contribution limits? Can I reimburse my account for admin fees, recurring maintenance fees, and startup fees? Can I reimburse my account for trading fees if I trade stocks or other securities? Can I contribute to someone else's HSA? Can I make my HSA contribution from my business? - How much can be contributed to an HSA? Annual contributions are capped at a high deductible of $3,500 for an individual and $7,000 for a family in 2019. Individuals over 55 may contribute an additional $1,000 per year. The annual maximum HSA contribution will change each January 1 based on the Consumer Price Index (CPI). The new contribution amounts will be announced by the IRS. There are no maximum limits on the account accumulation. If you had HDHP coverage for the full year, you can make the full catch-up contribution regardless of when your 55th birthday falls during the year. Contributions may be made by anyone on behalf of the account beneficiary. All HSA plans have an aggregate deductible where one or all family members contribute and work towards meeting a single deductible. You have until April 15, 2019 to make contributions to your HSA and claim it on your 2018 tax return. - How is the contribution limit determined? The contribution limit is determined by the IRS and is based on the Consumer Price Index. If you do not keep your coverage for at least 12 months, the contribution limit will be pro-rated based on the number of months in which your HSA-eligible health insurance was in effect. For example, if your coverage begins on March 1 and is in effect only through December, you will only be allowed to deposit 10/12 of the annual contribution limit. - What is the deadline for making my HSA contribution? You have until April 15 to establish your HSA and make your contribution for the previous year, as long as you had your HSA-qualified health insurance in place by December 1. However, keep in mind that you can only reimburse yourself for expenses that incurred after the HSA account was established. So it is in your best interest to establish your HSA as soon as possible, even if you only put $25 in to start. - What are the eligibility requirements for contributing to an HSA account? - Can another person who is over 65 contribute to the HSA of an individual under 65? Yes, as long as the contribution is made into the account of an eligible individual. 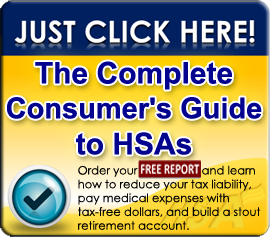 - If I am turning 65 this year, can I still make an HSA contribution. Your maximum contribution for the year will be 5/12 (for the five months of January through May) times the contribution limit of $4,500 ($3,500 plus a $1,000 catch-up contribution allowed for those over age 55). - Can individuals make their entire contribution to the HSA at the beginning of the year? Individuals can contribute their entire contribution at the beginning of the year, up to the applicable contribution limit. They might, however, have to make a corrective distribution later in the year if the individual's eligibility status changes during the year (for instance, if they become covered under another non-qualifying plan, or if their HDHP coverage ends). - Can an individual contribute a certain amount over the deductible amount to cover the setup and administrative fees of the HSA account? Fees can be paid directly to the HSA administrator without impacting the contribution limit. Alternatively, administrative fees can be paid from the HSA without incurring taxable income. - Does my HSA need to be set up with my health insurance company? No. The HSA can be set up with any qualified trustee or custodian. Many people choose to open their HSAs with a provider that is different from their insurance company to take advantage of lower fees or greater investment options, and to establish independence in the event that they change insurance providers. Please see our list of HSA administrators for more information. - Do I have to have "earned income" from a job (as opposed to income from dividends and interest) in order to deduct my HSA contributions for income tax purposes? No. HSA contributions are tax-deductible regardless of the source of your income. - Do the tax benefits phase out at certain income levels? No. Unlike many other tax breaks, there aren't any income limits. Anyone who buys a qualified high-deductible health insurance policy can open an HSA. - Do contributions to an HSA in any way affect my ability to contribute to an individual retirement account (IRA)? No. Your HSA contributions won't affect your IRA limits. An HSA is another tax-deferred way to save for retirement, with the added advantage that you can withdraw funds tax-free if they are used to pay for qualified medical expenses. - Do you recommend funding my HSA with a rollover from my IRA? You can fund your HSA with a one-time rollover from your IRA. If you can afford to fully fund your HSA without using a rollover from your IRA, you will get a full tax deduction for your HSA contribution. However, if you do not have enough money available to fully fund your account, moving money from your IRA to your HSA is a smart move. It will protect this money from ever being taxed so long as it is only used to pay for qualified medical expenses. - How does a spouse's health coverage impact contribution limits? If your spouse has an individual HSA-qualifying plan, then you would have to subtract your spouse’s contribution from the maximum that you could otherwise contribute. - How does a domestic partner's health coverage impact contribution limits? Unlike a spouse, a domestic partner's health coverage will generally not affect your ability to contribute to your HSA, even if you were to cover your domestic partner under your HDHP. Because no rule requires domestic partners to divide an HSA contribution in the manner that married individuals are required to, a domestic partner who is covered under an account owner's HDHP could open their own HSA and contribute the full amount of the deductible or the statutory maximum (whichever is less). Neither the Treasury nor the IRS has indicated that there is any problem with an account owner covering a domestic partner under an HDHP and having the domestic partner's expenses count toward satisfying the family deductible under the HDHP, notwithstanding that these individuals are not related. However, most individual insurance plans will not cover domestic partners, so the two individuals would probably need to get individual policies. Unlike a spouse, you may not take a tax-free distribution from your HSA to pay for your domestic partner's expenses, unless your domestic partner is considered to be a dependent under IRS Code Section 152. - Can I reimburse my account for admin fees, recurring maintenance fees, and startup fees? Yes, you can deposit money over and above your contribution limit to cover these fees. - Can I reimburse my account for trading fees if I trade stocks or other securities? No, these charges must be paid for from within the HSA. - Can I contribute to someone else's HSA? Yes. The owner of the HSA (and, in this case, not the person who made the contribution) would be able to claim the tax deduction. - Can I make my HSA contribution from my business? Yes. You can fund your HSA from your business, and count it as a business expense.